Loan Servicer Failed to Verify Records from its Predecessors | The Law Office of Emil Fleysher, P.A. Loan Servicer Failed to Verify Records from its Predecessors | The Law Office of Emil Fleysher, P.A. The foreclosing bank failed to verify the accuracy of the records it received from the previous loan servicer causing them to lose the case. Defense lawyer Bruce Jacobs claimed that beyond matching columns and fields and using a checklist to confirm receipt of key documents, the servicer did not verify details in the files. Miami-Dade Circuit Judge Beatrice Butchko vetoed Ocwen Financial Corp.’s banking records and left out its testimony after discovering the loan servicer failed to verify its predecessor’s records in a foreclosure case. Butchko allowed an involuntary dismissal in HSBC Bank USA’s suit against Miami homeowner Joseph Buset, whose loan was initially serviced by Litton Loan Servicing LP, which Ocwen acquired in 2011. The case hinged on whether the judge would allow the testimony about the servicing document transfer, which Ocwen calls its boarding process, or discount the financial documents as insufficient to meet the criteria for business records exempt from the hearsay rule. “This boarding process is a legal fiction, and it means something different to every entity,” Butchko ruled from the bench during a March 17 hearing. Ocwen bought Litton in a $264 million cash deal with Goldman Sachs Group Inc. that gave it servicing rights to Buset’s debt. Butchko had to select how to treat loan documents that became part of Ocwen’s business records but remained subject to hearsay objections unless the company could show it independently confirmed the data after transferring the loans. She considered evidence on Ocwen’s boarding process — the procedure by which financial services companies transfer account data from one lenders’ management system to another once trading loan portfolios. Witnesses for lenders in foreclosure cases must show they did independent fact-checking to qualify their files as business records and not hearsay. To achieve this, HSBC called four-year Ocwen employee Sherry Keeley to testify about the servicer’s business loan boarding practices and procedures. Keeley testified Ocwen ties dozens of points as part of a data mapping process to ensure accuracy. “Our starting point is identical to their ending point in regards to whether it’s payments or taxes, insurance, any financial information, late charges, fees,” she said. 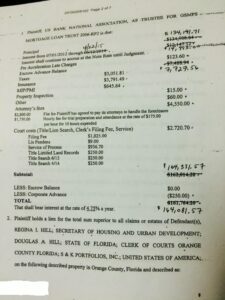 “Their ending figures are identical to our beginning.” But Buset’s attorney, Miami foreclosure defense lawyer Bruce Jacobs, seized on a $1,900 discrepancy in two versions of the default letter, to argue that beyond similar columns and fields and using a checklist to ensure receipt of key documents, the servicer failed to verify details in the files. “I have done this investigation for a long time,” he said, noting, “The appellate courts are going under this presumption that there is some type of meaningful auditing and verification.” But Jacobs maintained, “You just heard it from a lawyer who knows how to properly phrase the questions that she’s basically testifying to all — all of this is still hearsay.” Butchko was left weighing how to treat Ocwen’s post-acquisition files. Jacobs accepted the point. “Now that these companies are one and Ocwen has to continue to function with the prior servicer documents and they are one company, why should I require more from them?” the judge asked. Jacobs contended the bank witness failed to overcome the hearsay objection. But lender attorney Sarah Stemer of Brock & Scott in Fort Lauderdale argued the bank offered a qualified witness with first-hand knowledge of the boarding process to testify about its verification procedures.